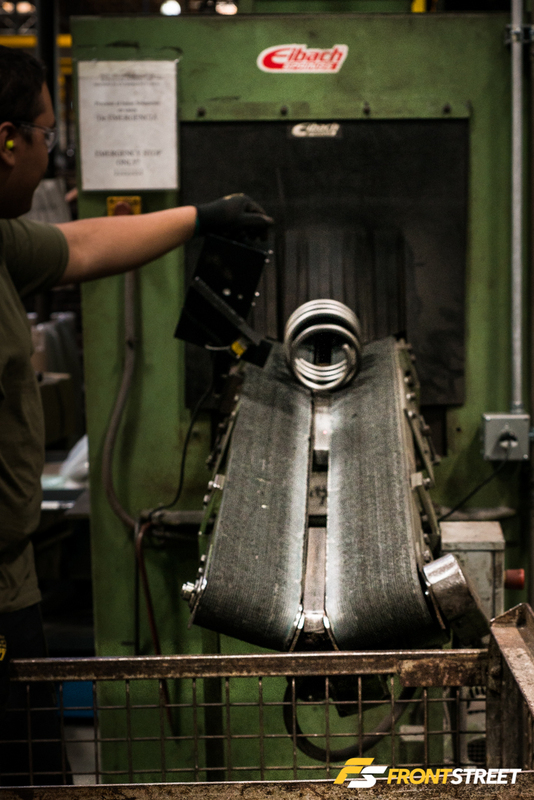 The privilege of seeing a production process will always yield a higher understanding of the end product. From something as simple as seeing your sandwich get made at a deli to witnessing a complicated watch get assembled, knowing everything going into it changes your perception. 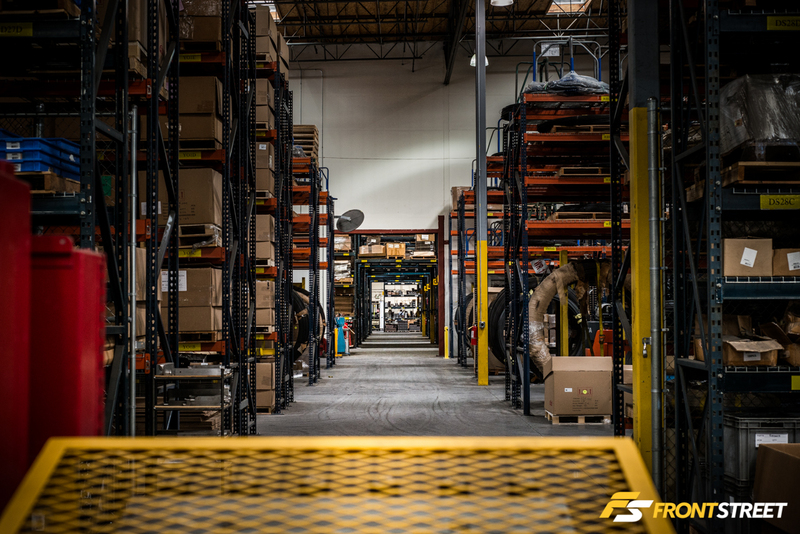 The way procedures are followed, the cleanliness of the facility, and the scrutiny all pieces undergo evoke an emotion tying you to that product. 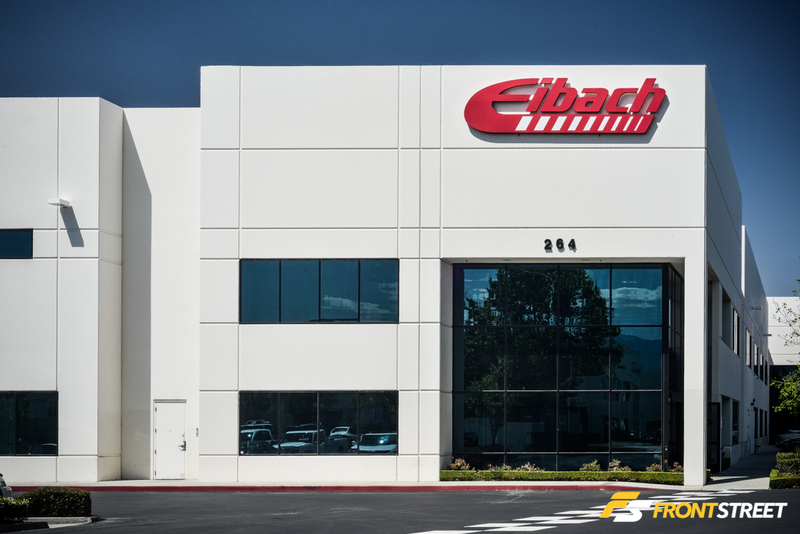 So when I had the opportunity to get a tour of the prestigious performance suspension company Eibach, I sprung on board! 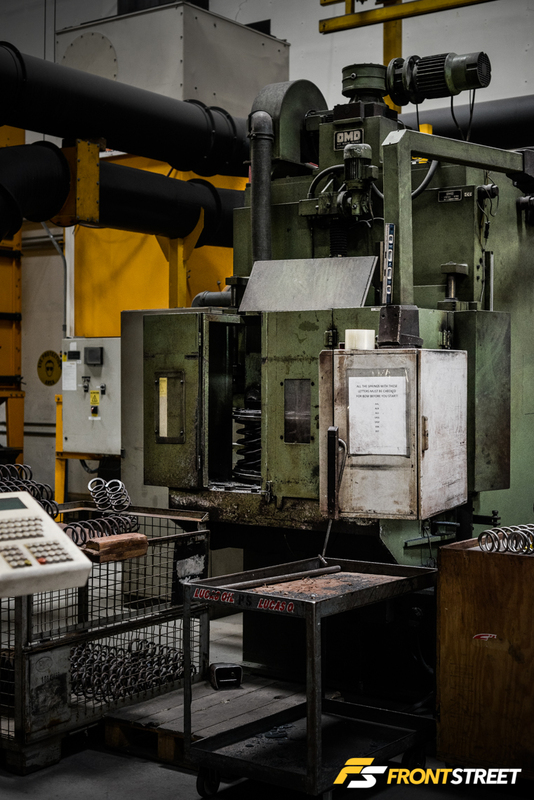 Started in Germany in 1951 by Heinrich Eibach, the business is still family owned by his son Wilfried. 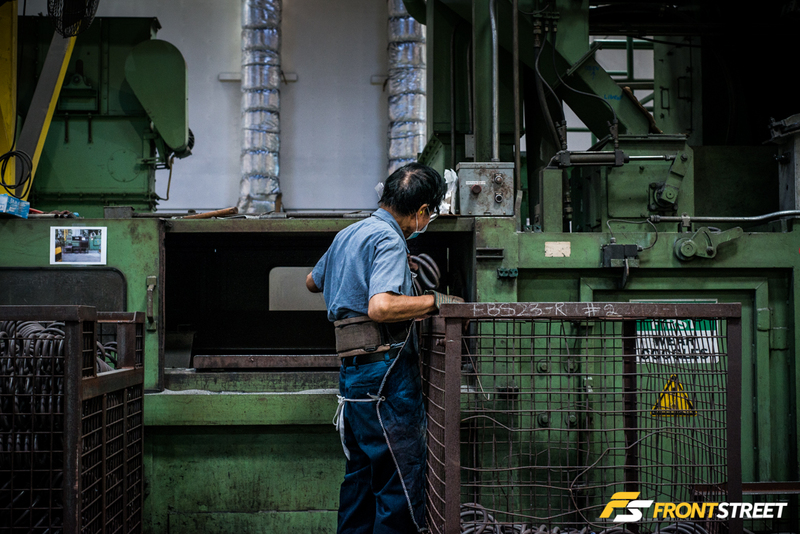 With production facilities in Europe, North America, and Asia they are not only making performance aftermarket automotive parts. Their quality suspension is now OEM equipment on many European automotive manufacturers. I’m going to walk you through a special behind the scenes tour of their California facility located in the city of Corona. 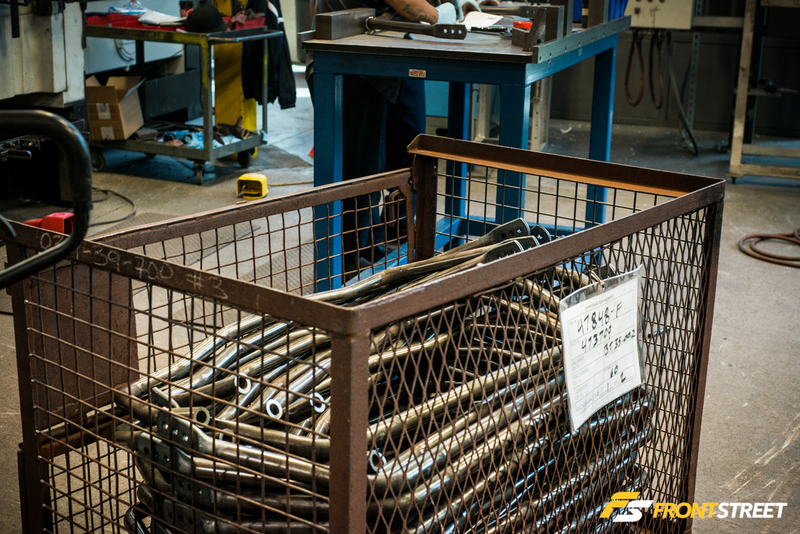 I’ll start off with everything that goes into the production of their spring/sway bar setups, but you’ll have to wait for Part 2 for the rest. 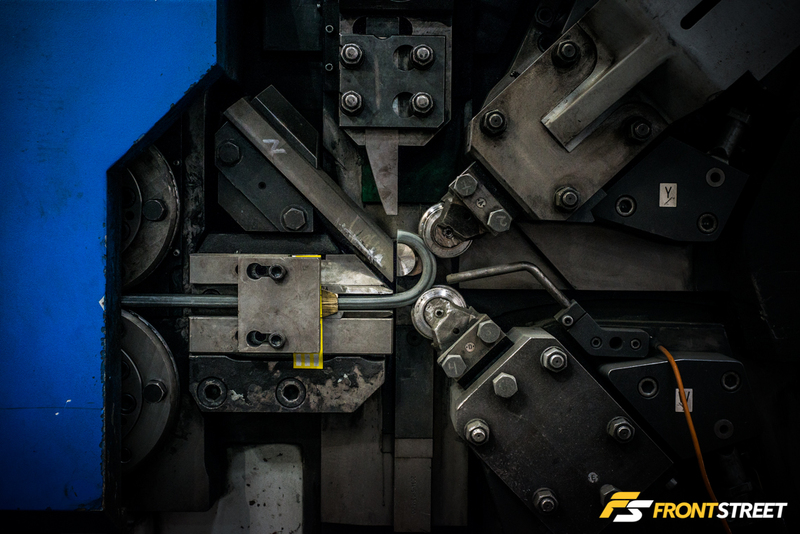 Pay close attention to this yellow tag, as every bin of springs has a test spring and spec sheet. 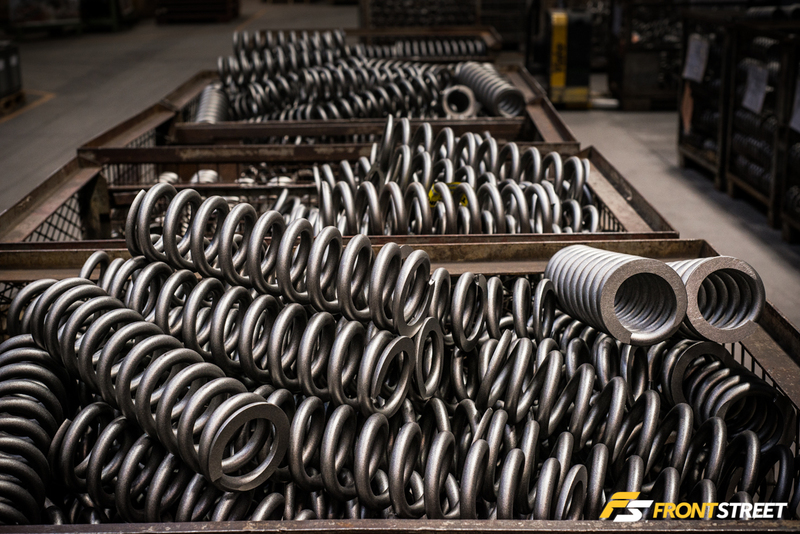 This spring is put through every step of the manufacturing process then tested to ensure the following production run will have no faults. This method takes more time at first, but ensures a higher quality finished product. For reasons of confidentiality I was unable to take detailed photos of the raw steel Eibach uses to make springs, but I snapped this photograph to show their shelves full of all the different diameters. These spools are wound so tight that if one were not confined to a certain space before becoming unwound it would rip down the shelves and walls that currently hold it. 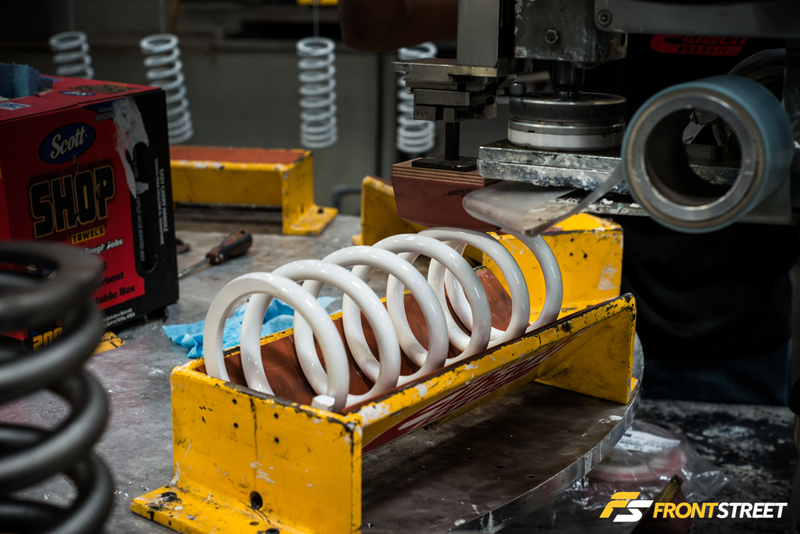 There are two ways to build a spring the first is “Coiling”. This is done with the material cold and only with material larger than 18mm in diameter. 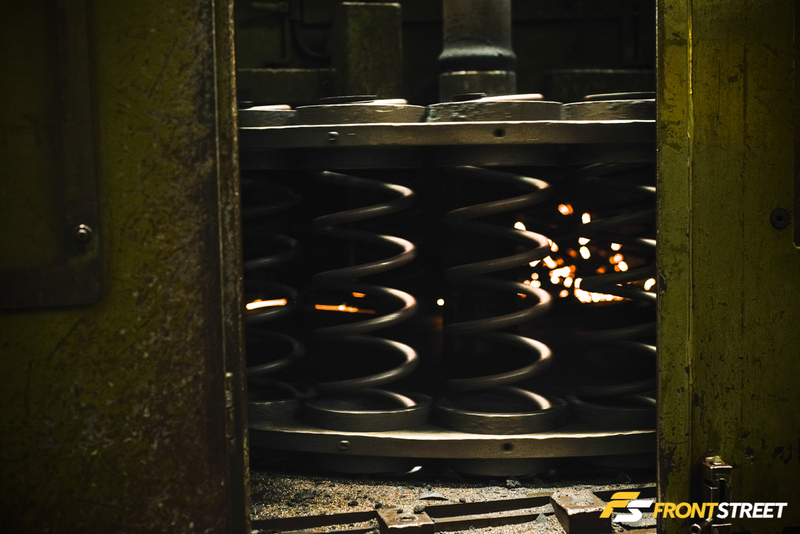 This process slowly winds the spring material around a Spike the spring is then cut from the spool of raw material. 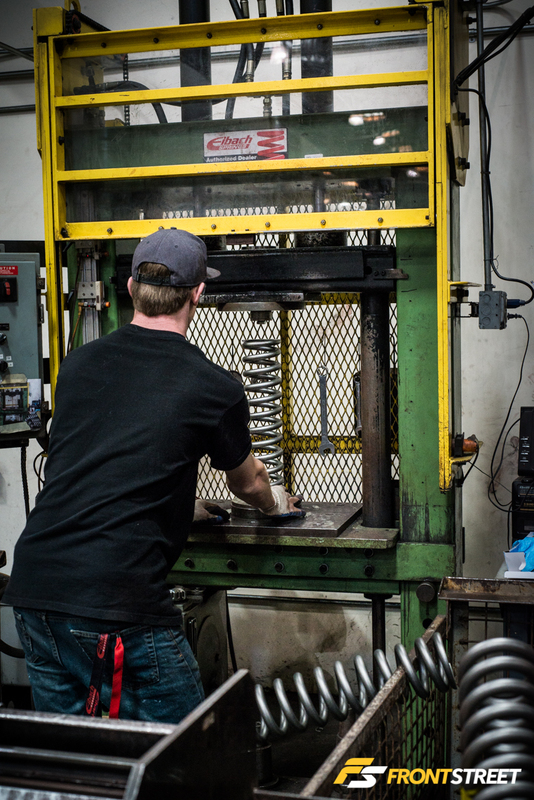 The second method is “Winding” over 90% of Eibach’s automotive springs are wound on these machines. 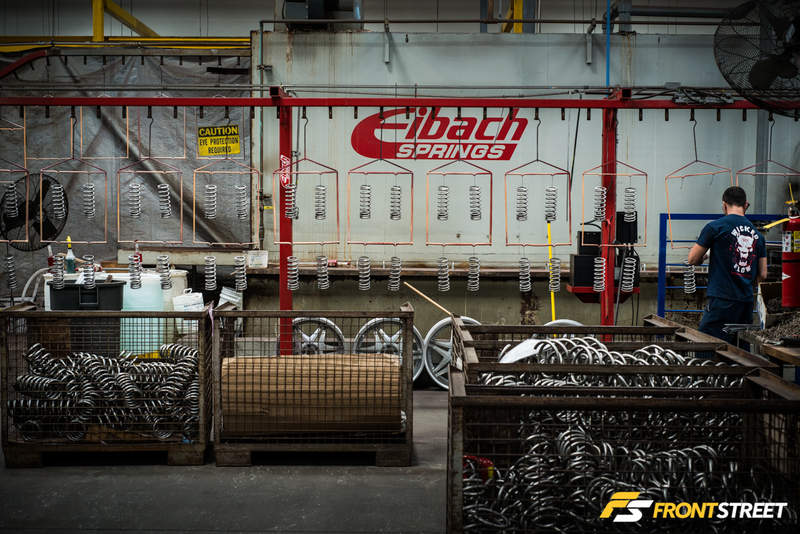 The proprietary CNC machine that Eibach uses hold large spools of high tensile wound steel to cold wind coil springs. 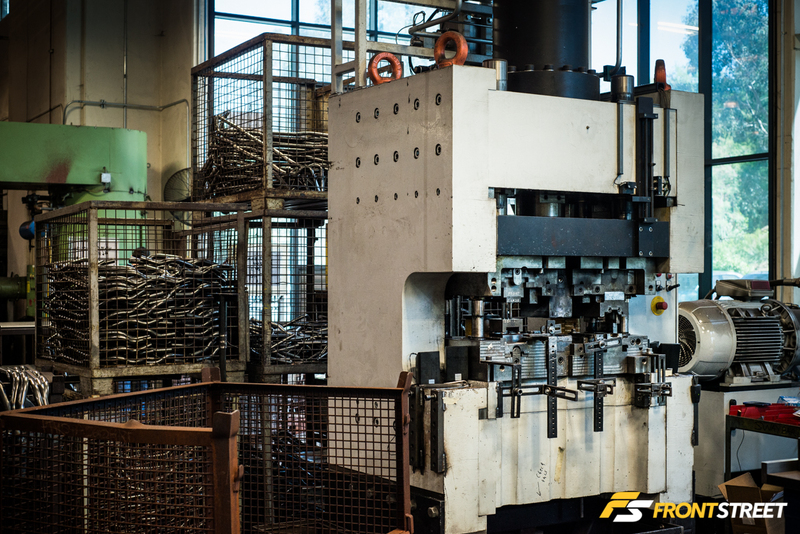 The setup time can vary between hours and days depending on the specifications required for the spring being wound. 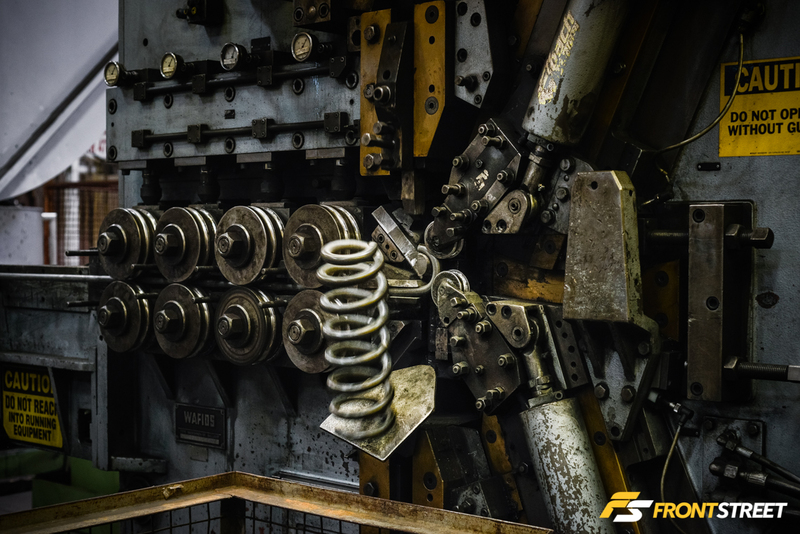 If the desired spring tolerances are achieved in the spring’s measurements, this machine is capable of coiling a new spring every couple seconds! Once wound, each spring is then measured for accuracy at numerous point of production. 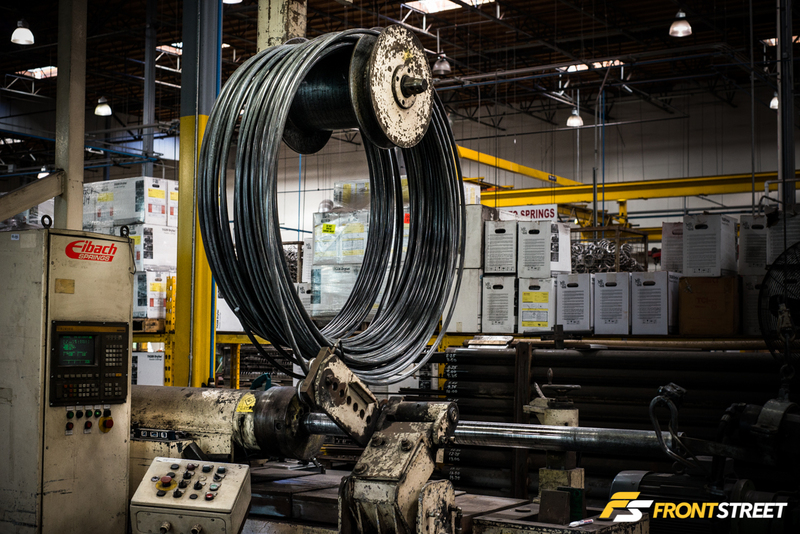 One thing you will often notice is the larger distance between coils, fewer coils mean less material is spun. The less material spun, the lighter the product. And who doesn’t want to shed weight wherever they can? 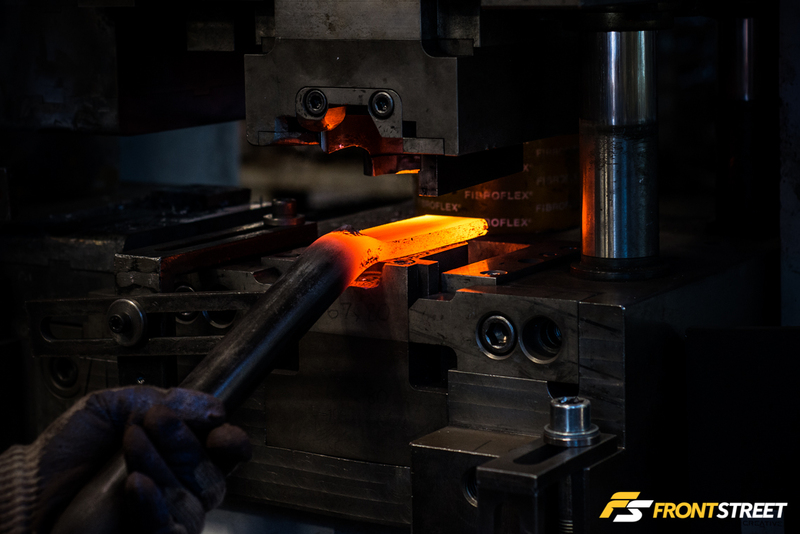 The springs are then put through a heat-treating process known as “tempering” or “hardening”. 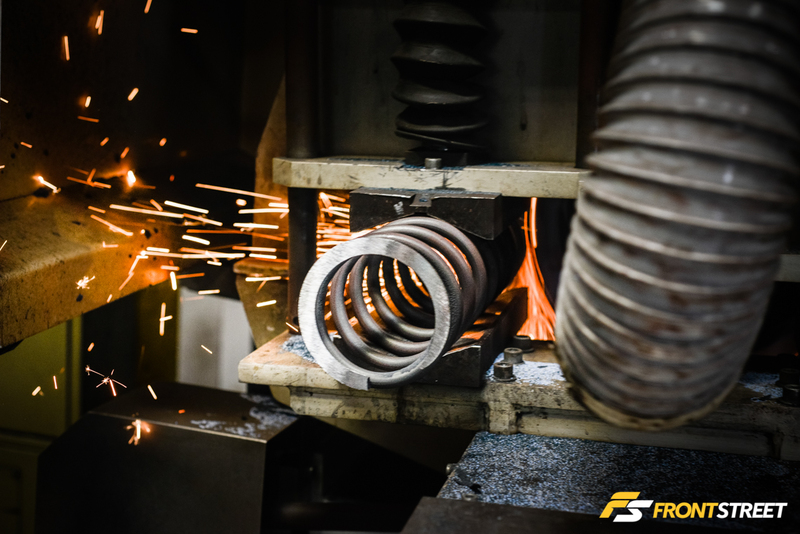 Tempering is for the cold wound CNC springs where a large batch of springs are set into a large oven for a specific amount of time. 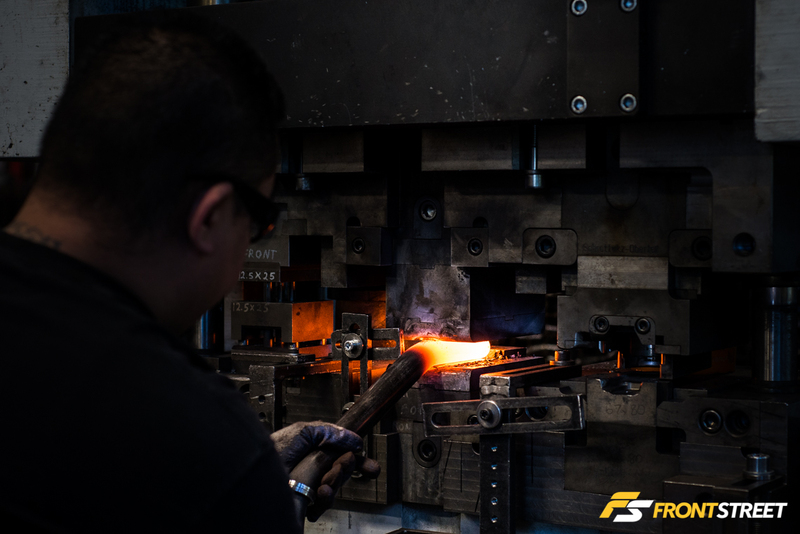 The tempering process will relax the molecules of the metal into the new shape of the spring. 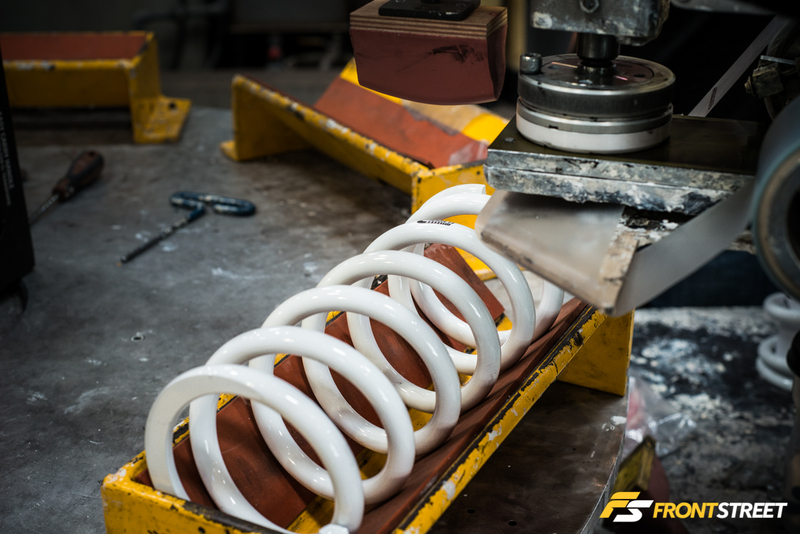 This ensures that the spring will now hold its shape instead of fighting itself to change shape over time. 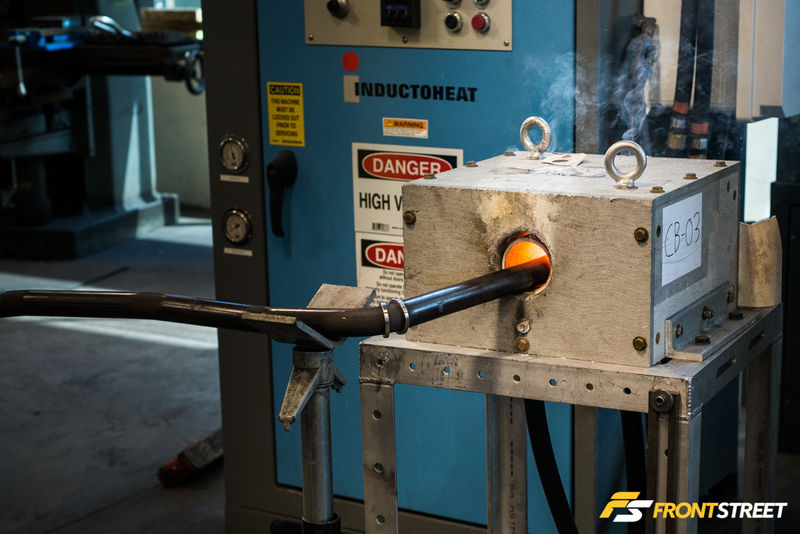 Hardening is where the larger diameter wire of coiled springs are heated to a high temperature inside a large furnace and then dropped into an oil bath (quenching). 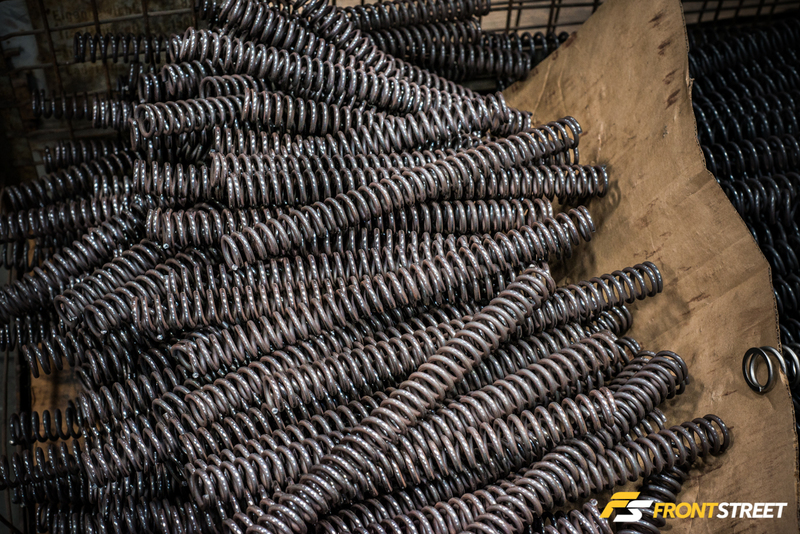 Hardening is required for the different spring steel used in this coiling process. 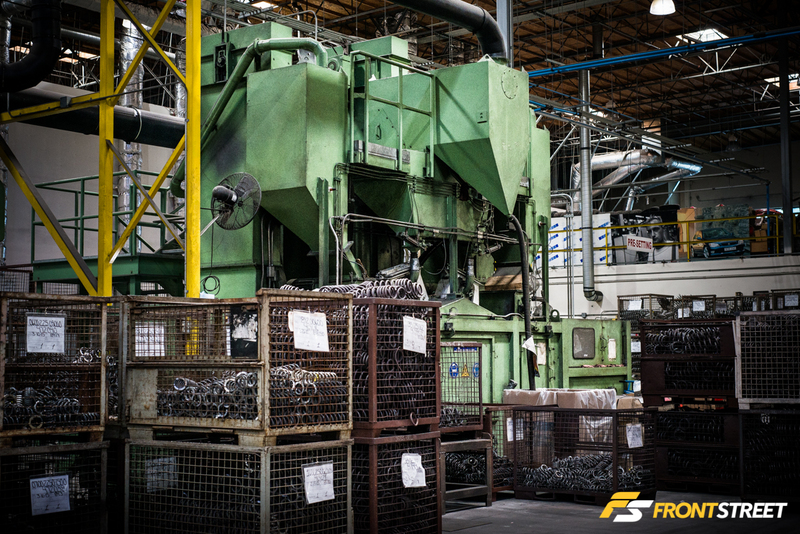 The next machine area is filled with numerous large grinders. No, not sandwiches, and not people dancing on each other. 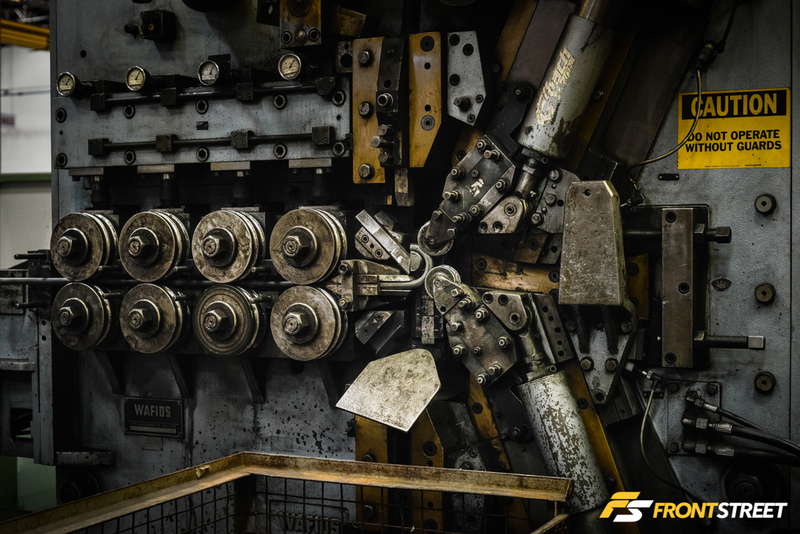 These are machines that house spinning stone cutting wheels, which actually grind away the ends of the springs revealing a smooth flat edge. 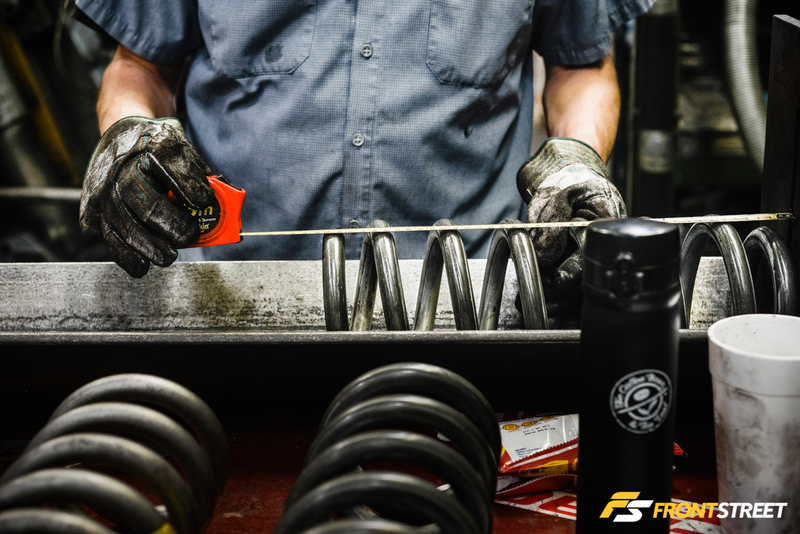 This step is required on coilover springs, fork springs and even some OEM applications that require a flat top or bottom. After grinding, they’re placed inside this green behemoth to complete the shot peen process. It’s less of a machine and more of a house. A house that would be very painful to live in, unless you’re a spring. Once placed in this opening, small media beads (think steel BB’s) are continuously blasted against the spring. 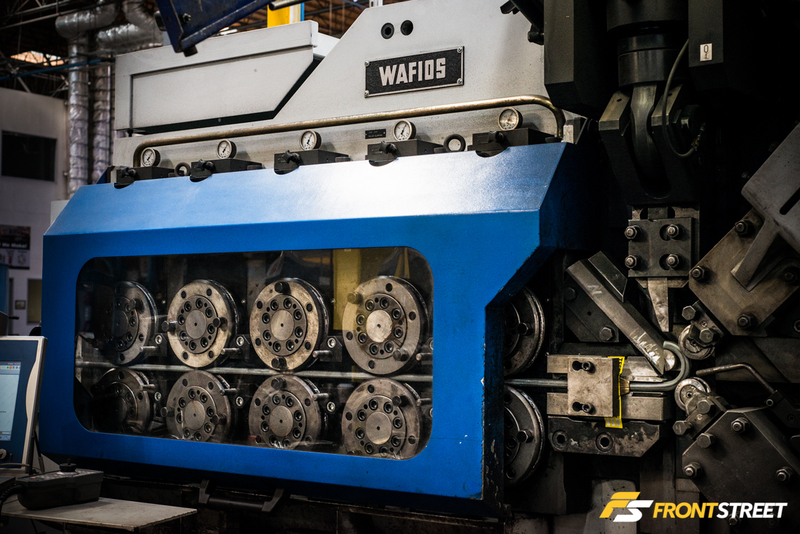 These beads are blasted with such force that the springs are basically being forged and stress-relieved, this process also removes a very thin outside layer of the spring. The result is a stronger, cleaner and slightly textured spring. This is a very crucial step to ensure the life of the spring. 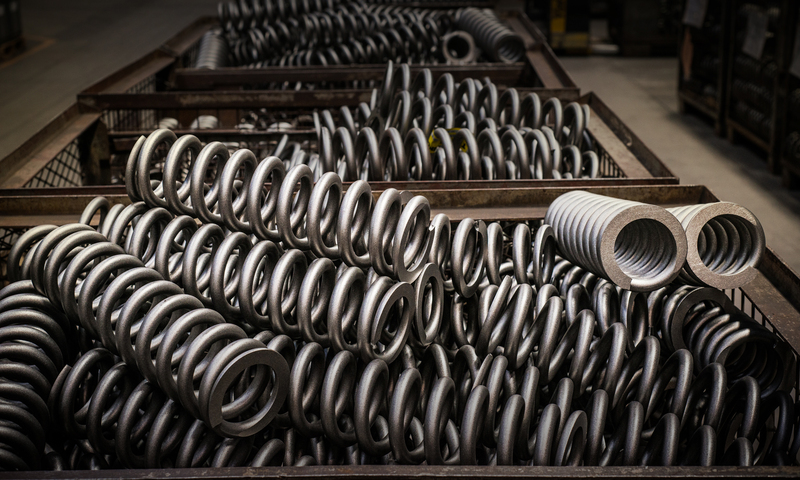 The shotpeened springs are then put through the “pre-setting” process. 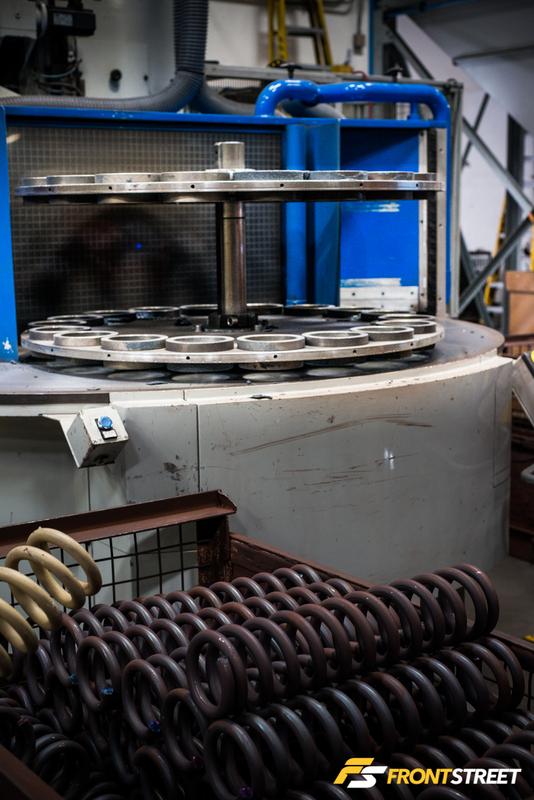 This involves individually placing each spring under a massive press. 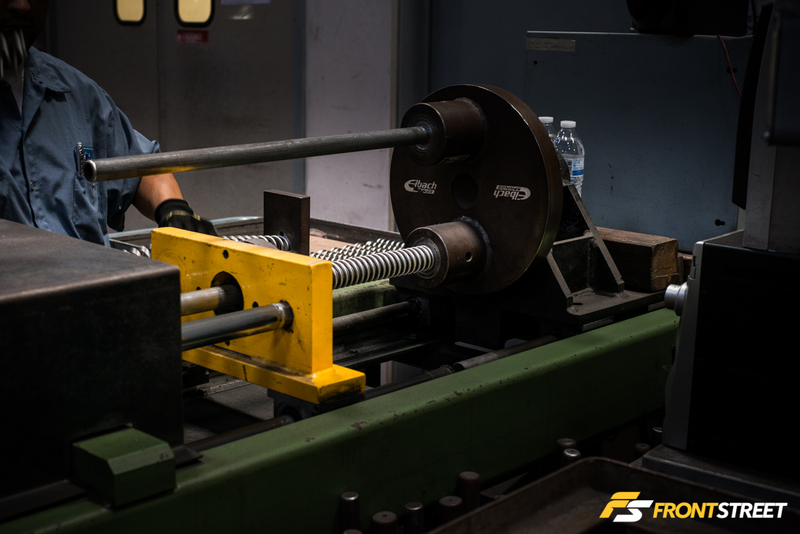 Applying downward force on the spring until it’s compressed to “block height” where the metal cannot compress into itself anymore. This process serves multiple purposes. One of the byproducts because the springs have been compressed this way, they will not settle after installation. This process is necessary regardless of spring size or application. 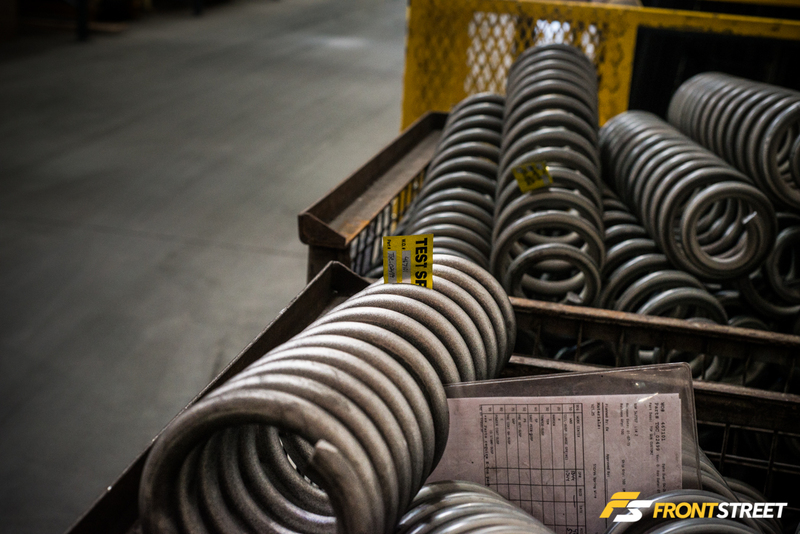 In fact, this final pre-set length is actually engineered into every spring and why Eibach offers their Million-Mile Warranty. Even these smaller springs are compressed in their own press. 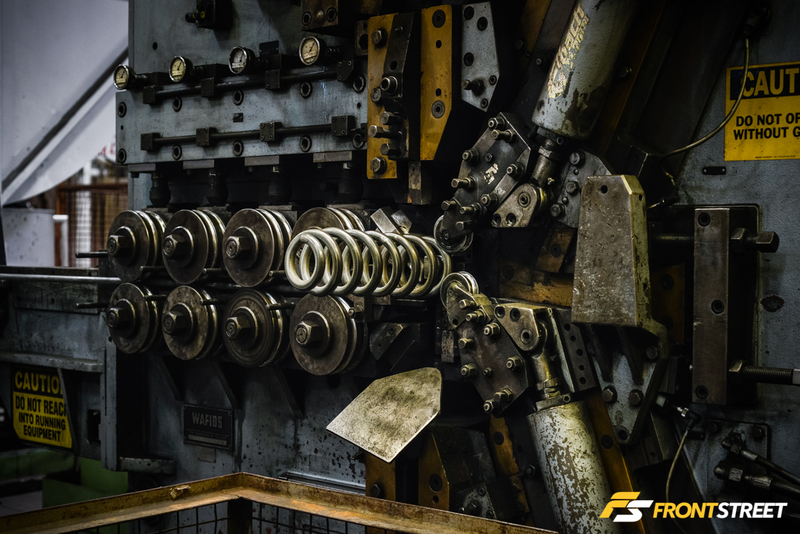 Each press varies the amount of force used based on the spring rate of the spring being compressed. After presetting they’re ready for their outerwear. 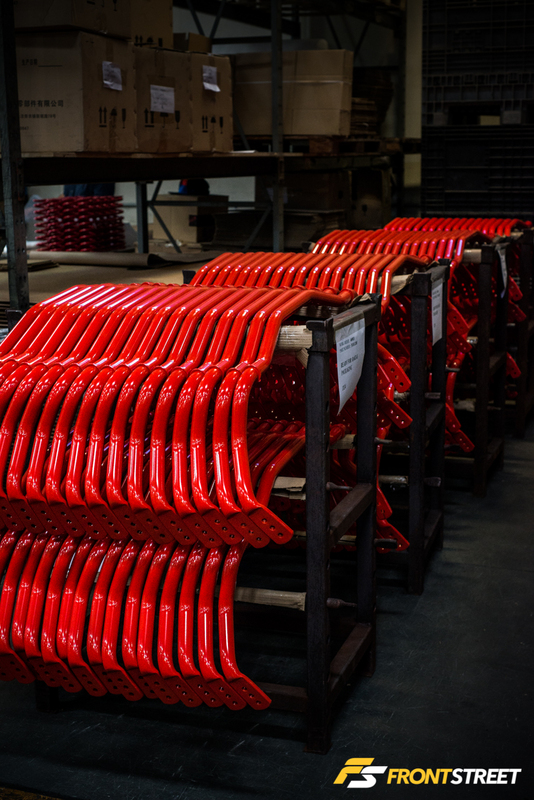 As they’re hung on these hangers, they move through the powder coating like an automatic carwash. 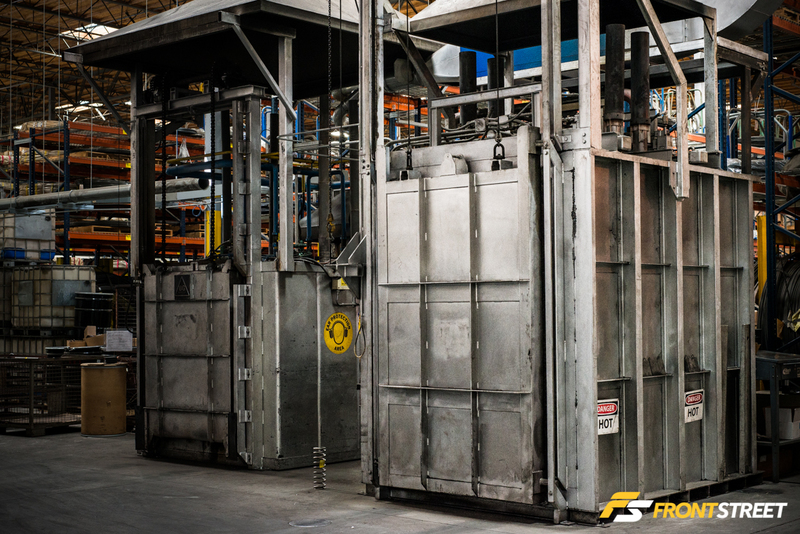 Being first cleansed in a zinc phosphate treatment; they are then powdered in house, and finally dried as they come out the other side. Now capable of exceeding the 400 straight hours of OEM salt spray tests. They exit wearing their new shiny Eibach red —er white coat in this case. The production today was actually working on Eibach’s highly regulated NASCAR springs, sprayed white to distinguish them from others. We’ll explain why in Part 2 of this post. The Eibach stamp is applied, and the spring’s creation is completed and ready for boxing. Ahh, found some Eibach red for you. 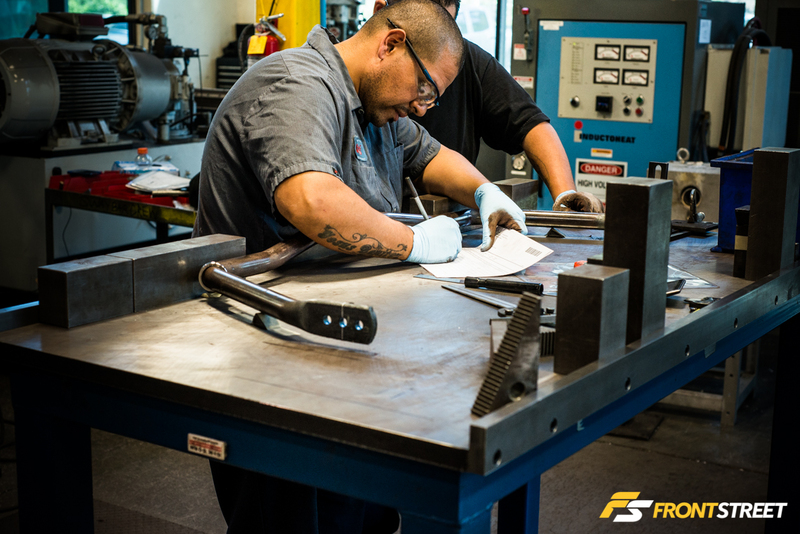 Along with the complete manufacturing and production of spring systems, the California location is responsible for sway bar production of all the North American market performance applications. However their new facility in Germany churns out their OE applications and heavy duty projects. It is capable of 250,000+ bars a year! 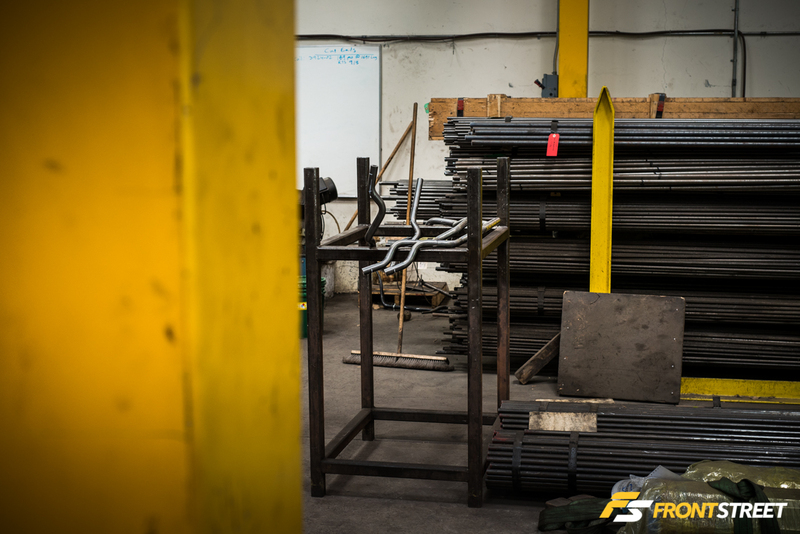 The large lots of raw steel material for the bars stack a lot nicer than the coils for the springs even though they use the same proprietary steel. After being bent to the correct dimensions, they’re left open on the ends and stacked in a bin. 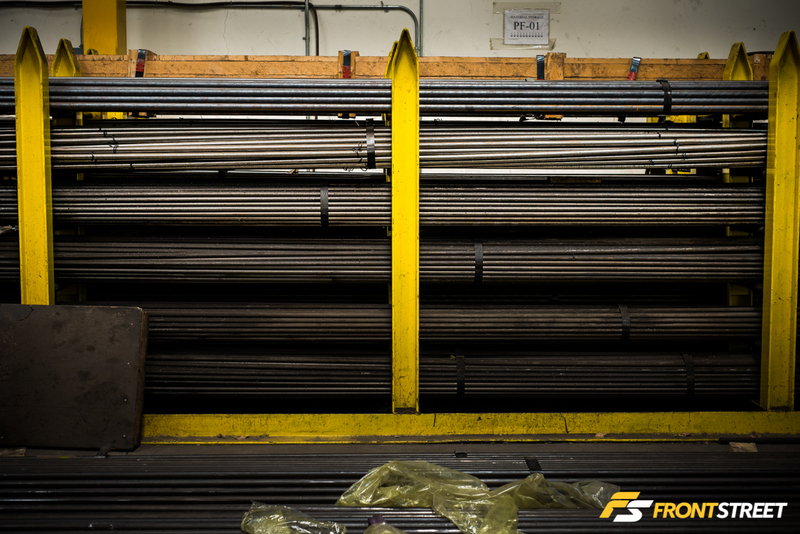 Where they’re individually taken, measured, examined, and prepped for their flat ends. 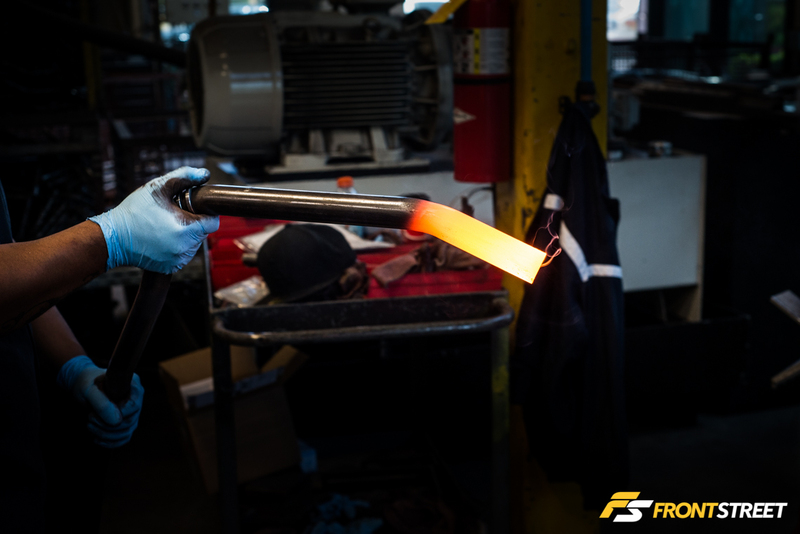 The induction heat furnace raises the temperature of the steel until it’s malleable to be pressed into its permanent shape. You’ve heard the phrase “white hot” . . . There is a large room for error going from the furnace to this gigantic press. 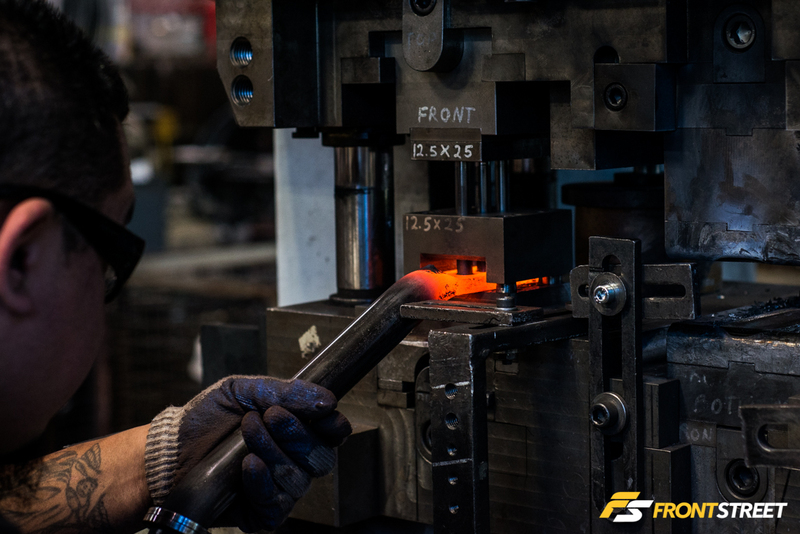 The metal needs to stay at temperature, the angle of the bar in the press needs to be correct, and it needs to pass through all three stages of this press without cooling. 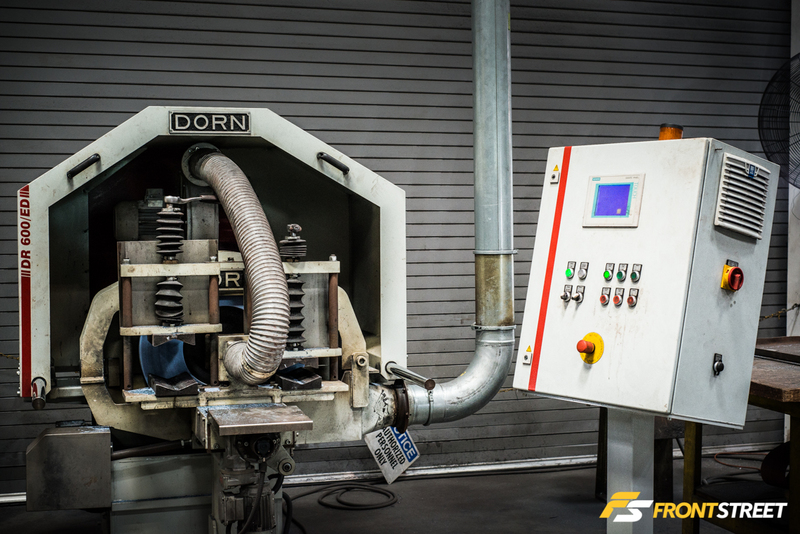 The first step in end-forming the round steel to create the new mounting surface. The square ends are then pressed off in favor of the rounded edge. Finally the mounting holes are pressed inside the flattened end. 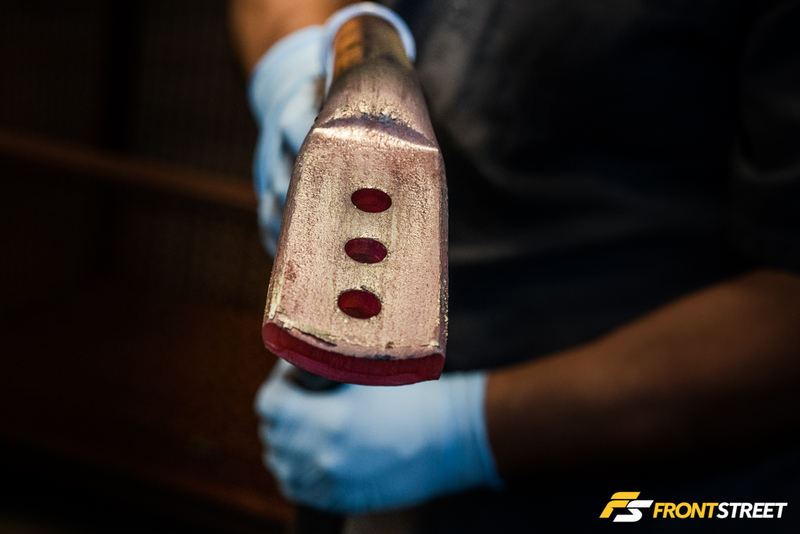 There may be imperfections along the surface of the bar that need to be ground off for the finished product. 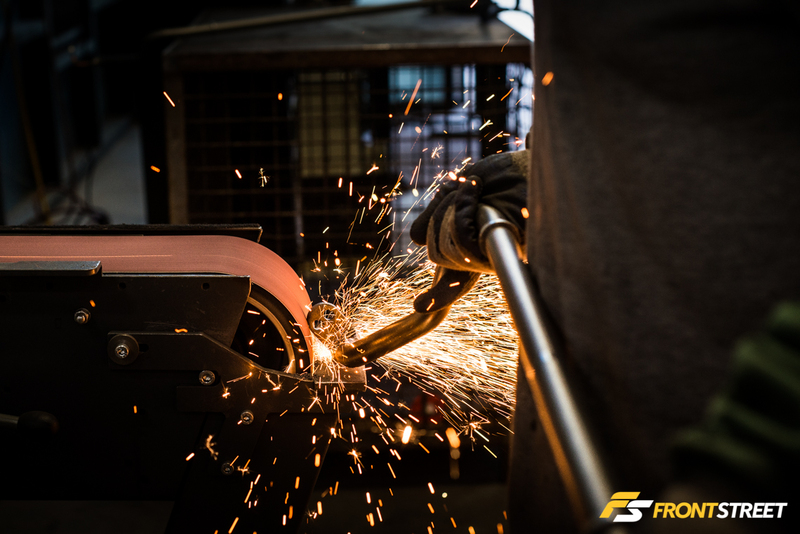 Grinding + metal = sparks. 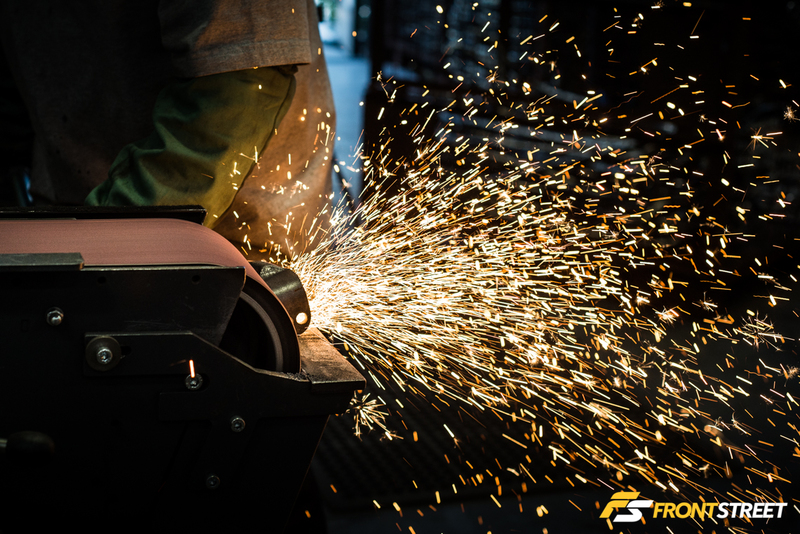 Even Smokey the Bear would enjoy these sparks. 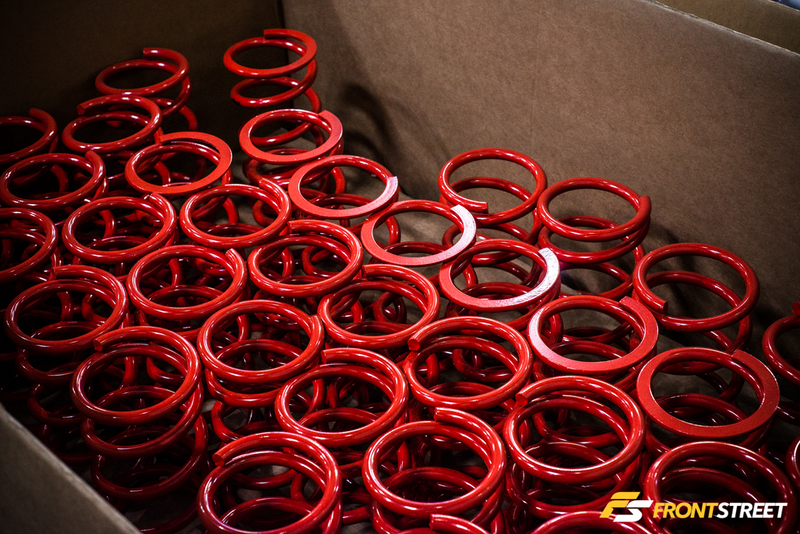 They are also put through the same tempering, shotpeening, zinc phosphate coating and powder process as the springs, for a finished product that shines in their new red. 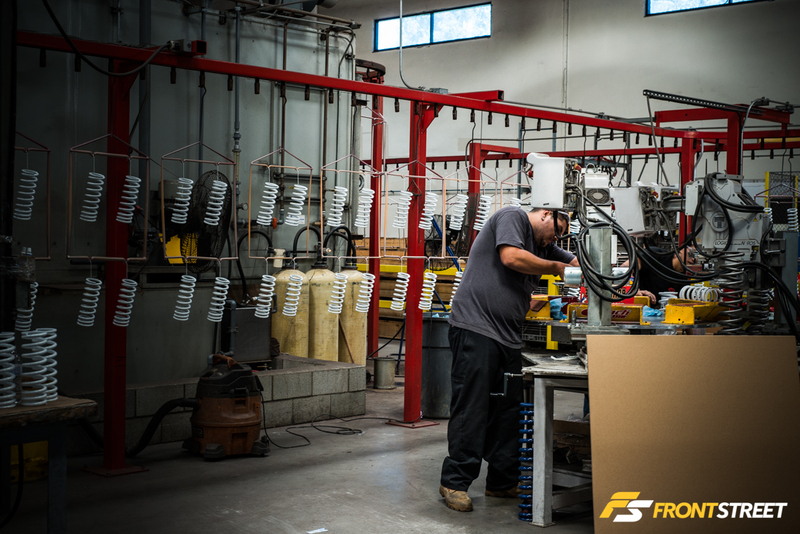 Which concludes our behind the scenes look into the production process of the springs and sway bars. 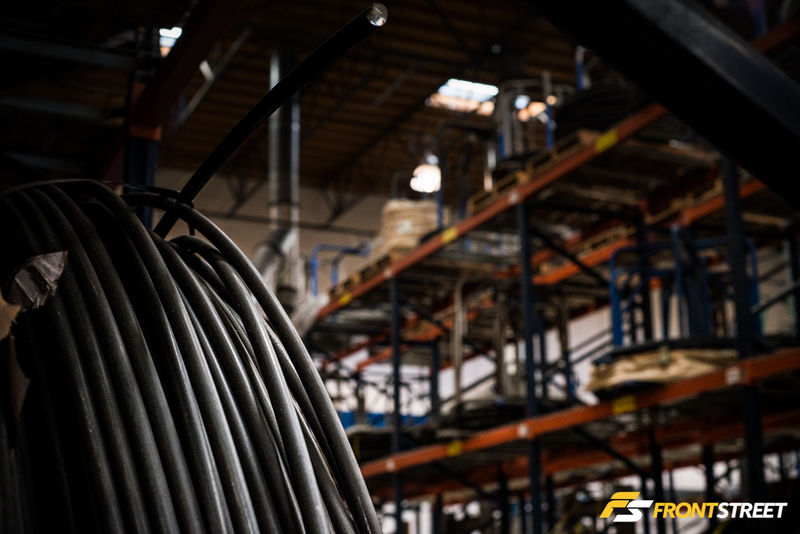 Be on the lookout for Part 2, including shock/strut production and the rest of their California facility.